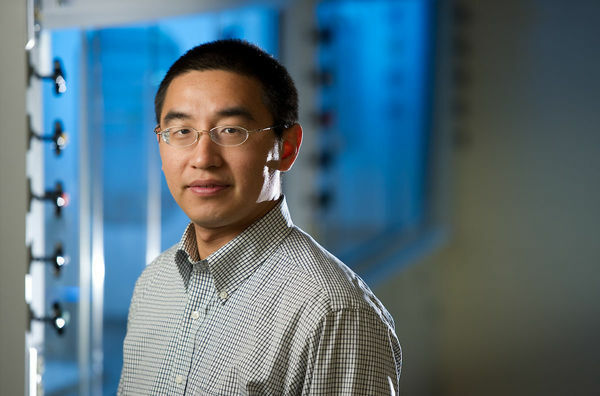 Haifeng Gao, an assistant professor of chemistry and biochemistry as well as an affiliated member of ND Energy and NDnano, is working at the newly opened McCourtney Hall to engineer soft nanomaterials and develop a polymer, or substance that has a molecular structure consisting of mostly large numbers of similar units bonded together, that could potentially carry insulin throughout the body. For the polymer to work, it would need to survive the harsh environment of the stomach, control the encapsulation of the insulin, and program the release of medication in a way that is as effective as current treatment methods. To do all of these things, Gao’s goal is to develop a unimolecular polymer carrier with multiple domains and functional groups, which utilizes several components that can work synergistically. Gao’s general interest in polymer-based nanomedicines gave him the opportunity to be the first Notre Dame researcher to participate in the Notre Dame-Eli Lilly and Co. Fellowship Program in Drug Discovery. The new program allows for faculty members to be a visiting scholar and experience first-hand the drug discovery and development process at Eli Lilly and Co. in Indianapolis. The Notre Dame-Eli Lilly and Co. Faculty Fellowship Program in Drug Discovery is now open for applications, with the formal fellowship beginning the summer after applying. Faculty research projects must align within the areas of Lilly’s current drug discovery interests, including oncology, diabetes, neurodegeneration, autoimmune disorders, and pain. To learn more about the fellowship program, please click here. Originally published by Brandi Klingerman at research.nd.edu on November 17, 2016.